committed to it since we started dating and got into the Buccaneer class in 2006. Thanks babe! moving fast first, then try to get the boat going higher. keeping the jib (forestay) from sagging. gybing ,even dousing and gybing. wasn’t that great. Teamwork, staying upright, upwind boat speed and upwind tactics were king in this regatta. land of beer, brats, cheese and no hurricanes except the drink! Winter is here, time to work on our Bucc’s, store them and start planning what events to attend in 2016. Definitely mark your calendars for BNAC ’16 which will be in Racine, WI on August 8-12, 2016. 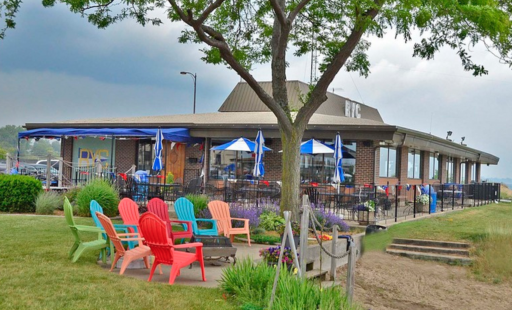 Racine Yacht Club is a great facility with a very established race program and regularly holds championship Regattas. Kenosha Yacht Club’s Fleet 15 will be lending a hand for the off the water duties and promises to put together a great event. We look forward to getting together with you. Mark your calendars. More details to come. Congratulations to Ed & Shannon Montano for taking first place in a rather convincing BNAC performance. Congratulations as well to Tim Olkowski for winning the B-Fleet & being forever banished from the B-fleet! Here is a link to the full results, more stories to come soon! Nomination Period for National Committee Officers is now Open! The Online Nomination period or three National Committee positions is now open. The Closing date is 10/11/15. The Position descriptions and responsibilities are described in The Buccaneer Class Constitution. Our current Secretary/Treasurer, Tony Chapman has agreed to serve for an additional two years. Additionally our current Publicity Chair, David Neely has agreed to serve for an additional two years. The National Committee endorses both of them for these positions and is seeking a nomination for each along with a second. Please show your support as well be Nominating them and making a Second for each. We need to also Nominate and Second a Class Member that will serve on the National Committee as the Membership Chair. Please discuss this with your fleet members and help us fill this Chair position by Nominating someone who will accept this position.